I’m inspired by a business leader, only for the second time in my life. Yes I know I’m a bit hard to impress! This time it is a 25 year old business leader I work with and I’m inspired because of his philosophy and his company purpose and vision. 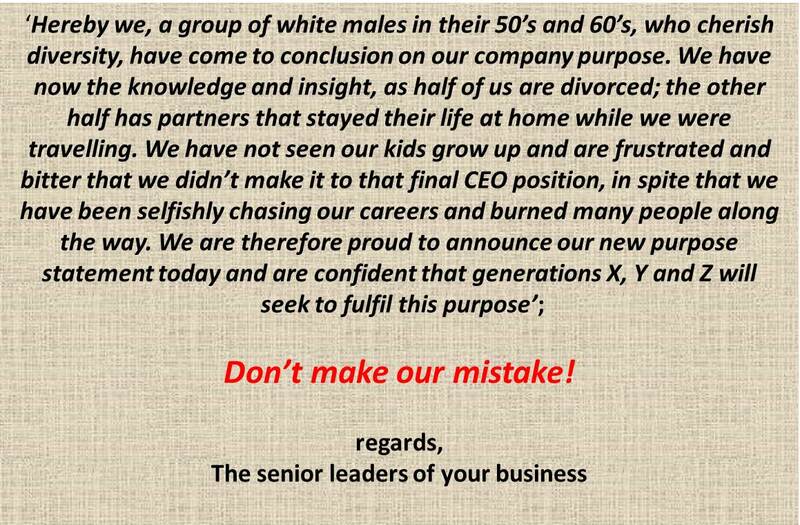 Purpose and vision statements are often made by a bunch of old people that struggle to connect with the workforce. But sometimes purpose statements get it right. One of the shortest and most powerful purpose statements must be Disney’s with; ‘Make people happy’. Google’s don’t be evil manifesto was great, but hard to sustain when you become a multi-billion dollar company with many fingers in many pies. They did a good job with their purpose of ‘Organizing the world’s information’. It is a very compelling one. Although a 2017 goal is technically more a vision statement than a mission statement or purpose, I think there is a lot to learn from this philosophy for other business leaders. Creating competitive advantage by manufacturing happiness in the workforce is a very relevant tip for many businesses that struggle with employee engagement. Who wouldn’t come out of bed and go the extra mile for some happiness at work?